It’s likely news to no one that the foodservice industry has a high turnover rate. With so many restaurants and an improving economy, servers and chefs are more willing to take chances for the tempting possibility of better pay or a more pleasant work environment. In 2015, the turnover rate for the hospitality segment was a staggering 72.1 percent, leaving operators dealing with the hassle and costs of replacing almost three quarters of their workforces. The turnover rate only tells half the story, though: replacements for workers who leave are getting harder and harder to find. It’s certainly troublesome to have to replace an employee. In addition to job postings and interviews taking time away from other tasks, you will have to manage shift coverage until a new hire is found and trained. According to a study by the Center for American Progress, replacing an employee costs you much more than time, with tangible costs of around 16 percent of the employee’s yearly salary for each new hire. This cost includes the cost of hiring and training a new employee as well as the productivity loss the business deals with while down a worker and training a new one. To put that in more concrete terms, it will cost your business about $3,328 to replace each $10/hour employee, and that’s assuming you can find a replacement at all. The improving job market has given workers more ability to be picky about where they work, forcing some restaurants to make hard decisions like reducing open hours due to the labor shortage. The foodservice industry gets to add an extra layer of complication to the cost of turnover. Return customers come back to a restaurant expecting a similar experience, and constantly replacing employees lessens your chances of being able to achieve the consistency those returning customers desire. You must also take into consideration the lost production and food quality your business incurs while coverage is stretched thin, as well as any waste that might be produced as a result of a new employee’s accidental blunders. 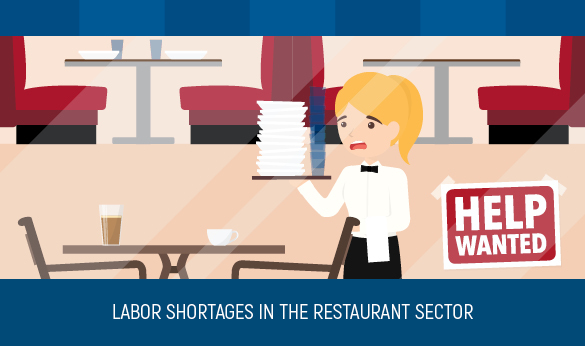 With rising wages and thinner margins, restaurants are facing difficult staffing challenges and retaining valuable employees is more important than ever. One of the most common reasons employees leave one job for another is in pursuit of better pay, so it can pay off in the long run to make sure your restaurant’s wages are competitive with other businesses in your area. Benefits like health insurance and vacation time can also go a long way toward keeping your employees around. Be sure to encourage feedback from employees, which allows you to address problems before they start costing you workers. To learn about other areas where you might have room for improvement, you can conduct exit interviews with everyone who leaves. Already on their way out the door, they should feel more liberty to be completely forthcoming. Just be sure you’re ready for their honesty and take any criticism as an opportunity for improvement. Another tactic many restaurants are employing in the fight to keep the best workers is employee incentive packages. These programs might include monetary bonuses or other gifts. Bryan King, owner of 12 Bones Smokehouse in Asheville, N.C., goes out of his way to make his employees feel appreciated with birthday cakes, free work shoes, and three weeks of paid vacation when the restaurant closes for the holidays each winter, resulting in a low turnover at his restaurant. Employee retention starts from the very beginning of a worker’s time with your business. Hiring the right people to begin with will decrease how often you have to replace them, but it can be difficult to tell from an application and one half-hour interview who will be a good fit for your company. Below are some ways to attract the right people to your company and reduce your overall turnover rate. Know what you are looking for before you ever post a job listing. Create a detailed job description and include it in your listing to help weed out uninterested parties before you spend time reading their applications. Optimize your job postings. Include wording that conveys the culture of your restaurant to attract people who will fit in with and enjoy it, and be sure to mention any incentives like higher-than-average wages or flexible schedules. Reach out to your existing fans on social media. These people are likely already familiar with your brand and know what they might expect working there. If you don’t have a large following on social media, you can also use targeted ads to let people in your area know you’re seeking applicants. Interview thoroughly, and consider having multiple interviews with different managers so that you have more than one opinion to take into account before extending an offer of employment.